Sun, beach... and what else is there to do? We would like to assist you in the active organization of your holiday therefore we have collect some tips for you. You enjoy walking and you like to participate in a guided hike? Then you will find our suggestions here. You enjoy cycling and you want to experience your holiday area with a nice bike ride? Then you will find our suggestions here. 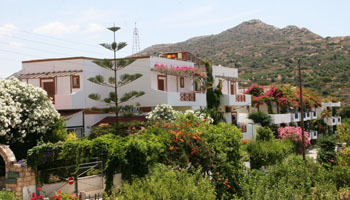 Armonia is a small, pretty, family run hotel situated on the periphery of Matala on the south coast of Crete in a calm area with a wonderful view of the surrounding mountains and the valley of Matala. The style of the hotel is a harmonious mixture of modern and traditional, of playful and soothing. The hotel is surrounded by a magnificent garden and offers visitors a beautiful entrance to wonderful walkingand cycling possibilities in the local mountain ranges and the coast. If you want to spend one or more weeks in peace and calm, Armonia can offer the perfect place to relax in a nice and friendly atmosphere, with simply nice individual service.